Trippi was a former senior adviser to Edwards' campaign. 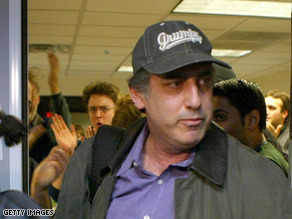 (CNN) - Joe Trippi, a former top aide to John Edwards, is sharply refuting a report a handful of campaign staffers knew about the former presidential candidate's affair and had plans to sabotage his White House bid, telling CNN Monday the claim is "complete bull s**t."
Trippi, a close advisor to Edwards during his Democratic presidential primary bid, also said if any campaign staffer actually knew the affair was true they were "not only malpracticing John Edwards but the country as well by not doing the right thing, going to him, and telling him he had to leave the race." The comments come a day after ABC News reported several Edwards campaign staffers "in the inner circle" began to believe rumors of an affair were true in late 2007. According to the story, the group had devised a "doomsday" strategy to sabotage the campaign if Edwards looked as if he would win the Democratic nomination. But Trippi, who worked closely with Edwards' most senior advisors, including Campaign Manager David Bonior and Deputy Campaign manager Jonathan Prince, suggested he would have been aware of a plan if one existed. "I don't think there was an hour Prince wasn't with me," he said, adding later, "I can't conceive of how it was possible that if someone had a secret plan I wasn't aware of it." In reality, Trippi said, Edwards' senior advisers immediately discounted the rumors, first reported by the National Enquirer in the fall of 2007, and never raised the possibility they might be true. "We were thinking there is no way in hell he would do this to Elizabeth," Trippi said. We were thinking how could the National Enquirer do this to her, when she has terminal cancer and tries to make a difference by helping her husband run for president." Edwards came in second in the Iowa caucuses on January 3, 2008, behind Barack Obama but slightly ahead of Hillary Clinton in the state delegate vote count. But five days later he finished a distant third in the New Hampshire primary. Edwards gave up his bid for the White House on January 30, the day after a disappointing third place finish in the South Carolina primary. Programming Note: Watch Elizabeth Edwards' exclusive interview on CNN's Larry King Live at 9 p.m. Eastern time Tuesday night. This is what happens when you let straight people get married. They do everything possible to denigrate that venerable institution. Quick, we must pass laws prohibiting opposite marriage so future wives will be spared this type of humiliation from their husbands. Who cares? Edwards is a liar and an idiot and is gone. He has zero chance of running for office again in the future. Doesn't this whole thing seem like it is driven by Republican media so desperate that they can't find anything on Obama and so eager to drum up whatever they can on someone else? Don't we have bigger problems than this? Why not more reporting on the "stress tests" and the underlying insolvency questions? He is lying like a dog. We all know they did it. Whatever blame is to be placed,it is allon john Edwards and no one else. Let these people move on witht eri lives and discuss it as they feel needed. $550 billion: U.S. Defense budget. Please include the defense budget for ALL countries…because unlike our OWN defense, the WORLDS hunger is not OUR problem alone. The US is the BIGGEST contributor to WORLD Hunger there is, so give credit where credit is due, and don't ride US on not giving enough when we give more then any other country. Our defense is a must, as is the support to our OWN people in OUR borders. Yes, I'm a MODERATE Democrat. We need the defense and to take care of OUR people. Not the world. cost of world hunger: $30 billion. It looks a LOT more embarassing when it's laid out like that. And I also beleive that the United States needs a strong Defense, but not a strong military-industrial complex. You can't blame the press for this one. Elizabeth brought this back into the forefront by writing and then promoting a book. Her assertion that he made "just this one mistake" is disingenuous at best. What he does privately is between him and his family but when caught in the public light and then repeatedly lying about it, even to his most senior supporters, cannot simply be cast asde as a private matter. I am sad for Elizabeth for all that she endures, and let none of us question her motives at this point because we can never appreciate fully her complex situation. And I despair for John who held the trust and aspirations of so many, only to throw away that precious treasure as if it were inconsequential. It is time for all to move on. It's interesting the way people think. Trippi says a staffer was "malpracticing Edwards" by not telling him to leave the race, if a staffer knew of the affair. What about Edwards - and his wife, who was in on the cover-up - malpracticing their staff, their party and potentially their country, if he had won the nomination? The Enquirer, for all its faults, has been 100 percent correct on this story from Day 1. And they're reporting the kid is Edwards'. It is hard to think of anyone more irrelevant than Edwards. Or more publicity-mad than Elizabeth Edwards? Maybe Dan and Marilyn Quayle ? @goodness, who cares: THE WIFE WROTE A BOOK – BOOKED HERSELF ON OPRAH TO HAWK IT! Does that not make them publicity hounds? What's next – Jerry Springer on Line 2? I don't think Trippi refuted this claim, I think he disputed it or contested it. Sounds small, but the distinction is significant. "Refute" means to prove to be false or erroneous. If you say somebody refuted a charge, you're saying they've proved it is wrong. I don't think that's what was meant here. I believe him. The look of betrayal on the faces of Edwards' staffers and advisors when the news broke was a rare instance of spontaneity and sincerity in politics. Edwards and his staff are LIARS!!!! Wait a minute – National Enquirer could sniff out this affair but the staffers who were with Edwards nearly 24/7 din't have a clue??? Either this guy is a liar or very stupid. Many people get a lot of pleasure from a chance to get all huffy with indignation with the shortcomings of someone else. You can read it in so many of the posts associated with this story. I believe that most of you who scorn poor Edwards really enjoy hearing and discussing all of the titillating details. This is just plain back-fence gossip disguised as a political discussion. If you have a father, a husband, and a son, it is likely that at least one of them will cheat on his wife – or has. Where are we on the torture issue? Are we any closer to justice? This proves what...?? All liberals are liers anyway...so.....what's your point....? Edwards was the cream of the Democratic Party elite along with HRC and Barrack Obama, and he was a stone's throw from the White House. The Dems shout from the roof tops about how great they are and in reality they are ALL self-serving FILTH. Listen to Obama, he is the same, gives a good speech, loogs good, but is full of BS. Serious? I HIGHLY doubt that any of these guys/gals would have made a peep if Edwards was on his way to win the White House. Did they just grow a conscious? I am really much more upset that Obama has lied about just about everything he promised while trying to get elected !! We believed him and now look what he has done to our country,this isn't change ,this is sabotoge.